It began as just another photo sharing startup founded by a Facebook exec. It ended up in 200,000 classrooms from kindergarten to 12th grade in 25,000 schools across 100 countries. All because of one truism: When a student’s audience is the world, they want their work to be good. When their audience is only their teacher, they just want it to be good enough. Seesaw’s educational app lets students save and share their assignments with their teachers, parents, and fellow classmates. They just snap a photo or video, draw, or write. But rather than just the finished product, students can add audio narration or doodled annotation to show how they got there. This lets teachers identify where students went wrong when they make mistakes. Seesaw sounds simple but solves some major problems. It lets teachers easily collect assignments and track a student’s progress over time. When parents want to know what their kid did at school, rather than asking and getting the same moody “nothing!”, they can just look in Seesaw. Students learn 21st century technology skills while getting faster feedback on work and an audience that encourages them to try harder. Instead of banning personal technology in the classroom, Seesaw lets teachers embrace it. Carl Sjogreen started teaching coding at a summer camp while he was still in middle school. “I’ve had two passions my entire life, one is technology and one is education” the Seesaw founder tells me. But tech took over. After working at Google, Sjogreen founded a travel startup called Nextstop that he sold to Facebook, where he became the director of product management. “When I left Facebook, my #1 goal was to start an education technology company, but I was really sad because I thought I didn’t know how to do it” Sjogreen remembers. He’d never been a full- time teacher. So he slipped back to what he knew, building a storytelling app in 2013 called Shadow Puppet. It let you add voice to photos to create shareable little videos about your vacation, night out, or adventure with the family. This was before Snapchat launched Stories, and the idea sounded novel, allowing Sjogreen to pull in seed funding from Greylock Discovery Fund and some rich buddies from Facebook. But Shadow Puppet flopped. “It was pretty clear 9 months in that it wasn’t going to be a business. I think we had one of those moments like, ‘Well, we better come up with something else. '” Sjogreen and his co-founder Adrian Graham pivoted Shadow Puppet towards the one audience who seemed keen on it: teachers. With just word of mouth, Seesaw took off. It was like “snatching success from the jaws of defeat”, Sjogreen says with a smile. Thanks to smart design, Seesaw sidesteps trouble that prevents other education apps from working right. First, the basic version is always free for students, teachers, and parents, so there’s no risk giving it a shot. It’s available for iOS, Android, Kindle, Chromebook, and web. Second, kids don’t need to fiddle with typing in an email address and password to sign in. Instead, they just hold the app up to a QR code poster in their classroom and select their name from the roster. Sjogreen explains that typically “20% of lesson time is spent just getting kids signed in to education apps. That’s why teachers are reluctant to adopt tech in the classroom”. If teachers want, students can peer review each other’s work, but that gets moderated too to thwart bullying. “Instead of that mean comment going to the kid and hurting them, the teacher goes to the kid that wrote it and says ‘How would this make you feel?’ It’s a learning opportunity” the founder says. Seesaw also substitutes for managing huge stacks of paper. 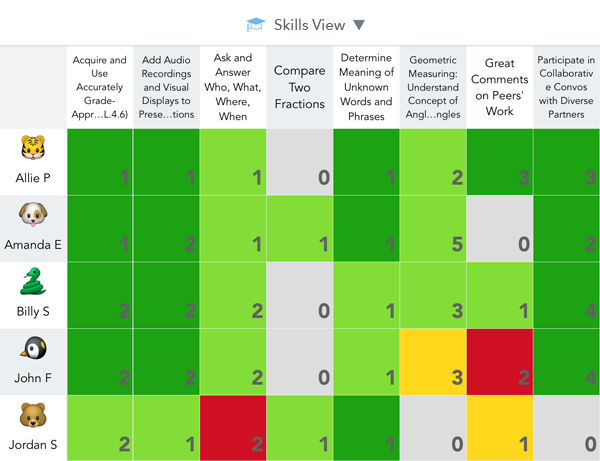 Beyond tracking each student separately, the new $120 per year Seesaw Plus premium version includes a skills view where teachers can rate students as green, yellow, or red on each lesson. A chart view both identifies students falling behind, but also which topics are giving the whole class trouble and might need a better lesson plan. Seesaw Plus isn’t the startup’s main business model, though. It’s more of an infiltration technique for bottom-up sales to school districts. The Seesaw For Schools paid version gives administrators a dashboard to monitor each classes’ workbook and integrate the data into their grading software. Seesaw is following the Dropbox playbook. Instead of top-down cold calling superintendandants, Seesaw aims to get a bunch of teachers in a district raving about it. That way administrators know if they pay to equip all their teachers with Seesaw, they’ll actually use it. There are other education software competitors in the market, though most focus on simply tracking grades or contacting parents with basic announcements. Remind, Canvas, Instructure, Pearson, and Blackboard make a few. Seesaw differentiates with its focus on what students create. Yet Seesaw’s challenge will be making the experience so simple that it becomes part of the natural teaching process, not an extra chore. If it distracts students or bogs down teachers, they’ll revert to the status quo. School districts are notoriously stingy too, so Seesaw will need to prove it boosts academic performance. Luckily some places like California now tie funding to parent involvement, which Seesaw can boost. Perhaps the biggest opportunity for Seesaw is assisting shy kids that fear raising their hands and asking for help. Seesaw could reveal who needs extra attention without embarrassing children in front of the class. Instead of bringing their teacher an apple, tomorrow’s students could bring them Seesaw’s app.